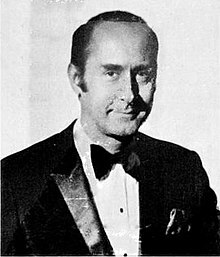 Enrico Nicola Mancini (April 16, 1924 – June 14, 1994) known professionally as Henry Mancini was an American composer, conductor and arranger, whom is best remembered for his film and television scores. Often cited as one of the greatest composers in the history of film, he won four Academy Awards, a Golden Globe, and twenty Grammy Awards, plus a posthumous Grammy Lifetime Achievement Award in 1995. Mancini was born in the Little Italy neighborhood of Cleveland, and was raised near Pittsburgh, in the steel town of West Aliquippa, Pennsylvania. His parents immigrated from the Abruzzo region of Italy. Mancini's father, Quinto (born March 13, 1893, Scanno, Italy) was a steelworker, who made him begin piccolo lessons at the age of eight. When Mancini was 12 years old, he began piano lessons. Quinto and Henry played flute together in the Aliquippa Italian immigrant band, "Sons of Italy". After graduating from Aliquippa High School in 1942, Mancini attended the renowned Juilliard School of Music in New York. In 1943, after roughly one year at Juilliard, his studies were interrupted when he was drafted into the United States Army. He initially served in the infantry, later transferring to an Army band. In 1945, he participated in the liberation of the Mauthausen-Gusen concentration camp in Austria. Newly discharged, Mancini entered the music industry. Entering 1946, he became a pianist and arranger for the newly re-formed Glenn Miller Orchestra, led by 'Everyman' Tex Beneke. After World War II, Mancini broadened his skills in composition, counterpoint, harmony and orchestration during studies opening with the composers Ernst Krenek and Mario Castelnuovo-Tedesco. In 1952, Mancini joined the Universal Pictures music department. During the next six years, he contributed music to over 100 movies, most notably Creature from the Black Lagoon, The Creature Walks Among Us, It Came from Outer Space, Tarantula, This Island Earth, The Glenn Miller Story (for which he received his first Academy Award nomination), The Benny Goodman Story and Orson Welles' Touch of Evil. During this time, he also wrote some popular songs. His first hit was a single by Guy Lombardo and His Royal Canadians titled I Won't Let You Out of My Heart. Mancini left Universal-International to work as an independent composer/arranger in 1958. Soon afterward, he scored the television series Peter Gunn for writer/producer Blake Edwards. This was the genesis of a relationship in which Edwards and Mancini collaborated on 30 films over 35 years. Along with Alex North, Elmer Bernstein, Leith Stevens and Johnny Mandel, Henry Mancini was a pioneer of the inclusion of jazz elements in the late romantic orchestral film and TV scoring prevalent at the time. Mancini's scores for Blake Edwards included Breakfast at Tiffany's (with the standard "Moon River") and Days of Wine and Roses (with the title song, "Days of Wine and Roses"), as well as Experiment in Terror, The Pink Panther (and all of its sequels), The Great Race, The Party, 10 (including "It's Easy to Say") and Victor Victoria. Another director with whom Mancini had a longstanding partnership was Stanley Donen (Charade, Arabesque, Two for the Road). Mancini also composed for Howard Hawks (Man's Favorite Sport?, Hatari! – which included the well-known "Baby Elephant Walk"), Martin Ritt (The Molly Maguires), Vittorio de Sica (Sunflower), Norman Jewison (Gaily, Gaily), Paul Newman (Sometimes a Great Notion, The Glass Menagerie), Stanley Kramer (Oklahoma Crude), George Roy Hill (The Great Waldo Pepper), Arthur Hiller (Silver Streak), Ted Kotcheff (Who Is Killing the Great Chefs of Europe? ), and others. Mancini's score for the Alfred Hitchcock film Frenzy (1972) in Bachian organ andante, for organ and an orchestra of strings was rejected and replaced by Ron Goodwin's work. Mancini scored many TV movies, including The Moneychangers, The Thorn Birds and The Shadow Box. He wrote many television themes, including Mr. Lucky (starring John Vivyan and Ross Martin), NBC Mystery Movie, What's Happening! !, Tic Tac Dough (1990 version) and Once Is Not Enough. In the 1984–85 television season, four series featured original Mancini themes: Newhart, Hotel, Remington Steele, and Ripley's Believe It or Not. Mancini also composed the "Viewer Mail" theme for Late Night with David Letterman. Mancini composed the theme for NBC Nightly News used beginning in 1975, and a different theme by him, titled Salute to the President was used by NBC News for its election coverage (including primaries and conventions) from 1976 to 1992. Salute to the President was only published in a school-band arrangement, although Mancini performed it frequently with symphony orchestras on his concert tours. Songs with music by Mancini were staples of the easy listening genre from the 1960s to the 1980s. Some of the artists who have recorded Mancini songs include Andy Williams, Paul Anka, Pat Boone, Anita Bryant, Jack Jones, Frank Sinatra, Perry Como, Connie Francis, Eydie Gorme, Steve Lawrence, Trini Lopez, George Maharis, Johnny Mathis, Jerry Vale, Ray Conniff, Quincy Jones, The Lennon Sisters, The Lettermen, Herb Alpert, Eddie Cano, Frank Chacksfield, Warren Covington, Sarah Vaughn, Shelly Manne, James Moody, Percy Faith, Ferrante & Teicher, Horst Jankowski, Andre Kostelanetz, Peter Nero, Liberace, Mantovani, Tony Bennett, Julie London, Wayne Newton, Arthur Fiedler and the Boston Pops Orchestra, Peggy Lee, and Matt Monro. The Anita Kerr Quartet won a Grammy award (1965) for their album We Dig Mancini, a cover of his songs. Lawrence Welk held Mancini in very high regard, and frequently featured Mancini's music on The Lawrence Welk Show (Mancini made at least one guest appearance on the show). Mancini briefly hosted his own musical variety TV show in a similar format to Welk's, The Mancini Generation, which aired in syndication during the 1972-73 season. Mancini recorded over 90 albums, in styles ranging from big band to light classical to pop. Eight of these albums were certified gold by the Recording Industry Association of America. He had a 20-year contract with RCA Victor, resulting in 60 commercial record albums that made him a household name among artists of easy-listening music. Mancini's earliest recordings in the 1950s and early 1960s were of the jazz idiom; with the success of Peter Gunn, Mr. Lucky, and Breakfast at Tiffany's, Mancini shifted to primarily recording his own music in record albums and film soundtracks. (Relatively little of his music was written for recordings compared to the amount that was written for film and television.) Beginning with his 1969 hit arrangement of Nino Rota's A Time for Us (as his only Billboard Hot 100 top 10 entry, the #1 hit "Love Theme from Romeo and Juliet") and its accompanying album A Warm Shade of Ivory, Mancini began to function more as a piano soloist and easy-listening artist primarily recording music written by other people. In this period, for two of his best-selling albums he was joined by trumpet virtuoso and The Tonight Show bandleader Doc Severinsen. Among Mancini's orchestral scores are (Lifeforce, The Great Mouse Detective, Sunflower, Tom and Jerry: The Movie, Molly Maguires, The Hawaiians), and darker themes (Experiment in Terror, The White Dawn, Wait Until Dark, The Night Visitor). Mancini was also a concert performer, conducting over fifty engagements per year, resulting in over 600 symphony performances during his lifetime. He conducted nearly all of the leading symphonies of the world, including the London Symphony Orchestra, the Israel Philharmonic, the Boston Pops, the Los Angeles Philharmonic and the Royal Philharmonic Orchestra. One of his favorites was the Minnesota Orchestra, where he debuted the Thorn Birds Suite in June 1983. He appeared in 1966, 1980 and 1984 in command performances for the British Royal Family. He also toured several times with Johnny Mathis and also with Andy Williams, who had each sung many of Mancini's songs; Mathis and Mancini collaborated on the 1986 album The Hollywood Musicals. In 1987 he conducted an impromptu charity concert in London in aid of Children In Need. The concert included Tchaikovsky's 1812 Overture with firework accompaniment over the River Thames. Shortly before his death in 1994, he made a one-off cameo appearance in the first season of the sitcom series Frasier, as a call-in patient to Dr. Frasier Crane's radio show. Mancini voiced the character Al, who speaks with a melancholy drawl and hates the sound of his own voice, in the episode "Guess Who's Coming to Breakfast?" Moments after Mancini's cameo ends, Frasier's radio broadcast plays "Moon River". Mancini also had an uncredited performance as a pianist in the 1967 movie Gunn, the movie version of the series Peter Gunn, the score of which was composed by Mancini. In the 1966 Pink Panther cartoon Pink, Plunk, Plink, the panther commandeered an orchestra and proceeded to conduct Mancini's theme for the series. At the end, the shot switched to rare live action, and Mancini was seen alone applauding in the audience. Mancini also made a brief appearance in the title sequence of 1993's Son of the Pink Panther, allowing the panther to conduct Bobby McFerrin in performing the film's theme tune. Mancini died of pancreatic cancer in Los Angeles on June 14, 1994. He was working at the time on the Broadway stage version of Victor/Victoria, which he never saw on stage. Mancini was survived by his wife of 43 years, singer Virginia "Ginny" O'Connor, with whom he had three children. They had met while both were members of the Tex Beneke orchestra, just after World War II. In 1948, Mrs. Mancini was one of the founders of the Society of Singers, a non-profit organization which benefits the health and welfare of professional singers worldwide. Additionally the Society awards scholarships to students pursuing an education in the vocal arts. One of Mancini's twin daughters, Monica Mancini, is a professional singer; her sister Felice runs The Mr. Holland's Opus Foundation (MHOF). His son Christopher is a music publisher and promoter in Los Angeles. In 1996, the Henry Mancini Institute, an academy for young music professionals, was founded by Jack Elliott in Mancini's honor, and was later under the direction of composer-conductor Patrick Williams. By the mid 2000s, however, the institute could not sustain itself and closed its doors on December 30, 2006. However, the American Society of Composers, Authors and Publishers (ASCAP) Foundation "Henry Mancini Music Scholarship" has been awarded annually since 2001. While still alive, Henry created a scholarship at UCLA and the bulk of his library and works are archived in the music library at UCLA. In 2005, the Henry Mancini Arts Academy was opened as a division of the Lincoln Park Performing Arts Center. The Center is located in Midland, Pennsylvania, minutes away from Mancini's hometown of Aliquippa. The Henry Mancini Arts Academy is an evening-and-weekend performing arts program for children from pre-K to grade 12, with some classes also available for adults. The program includes dance, voice, musical theater, and instrumental lessons. The American Film Institute ranked Mancini's songs Moon River No. 4 and Days of Wine and Roses No. 39 on their list of the greatest songs and his score for The Pink Panther No. 20 on their list of the greatest film scores. His scores for Breakfast at Tiffany's (1961), Charade (1963), Hatari! (1962), Touch of Evil (1958) and Wait Until Dark (1967) were also nominated for the list. Mancini was nominated for seventy-two Grammy Awards and won twenty. He was nominated for eighteen Academy Awards and won four. He also won a Golden Globe Award and was nominated for two Emmy Awards. In 1961, Mancini won two Academy Awards, one for "Moon River" for Best Original Song and one for Best Scoring of a Dramatic or Comedy Picture for the movie Breakfast at Tiffany's. In 1962, he won Best Original Song again, this time for "Days of Wine and Roses". He won Best Original Score again in 1982 for the movie Victor/Victoria. On April 13, 2004, the United States Postal Service honored Mancini with a thirty-seven cent commemorative stamp. The stamp was painted by artist Victor Stabin and shows Mancini conducting in front of a list of some of his most famous movie and TV themes. Note: Most of Mancini's scores were not released on LP soundtrack albums. His TV movie music albums were not soundtrack albums but are titled "Music from ..." or "Music from the Motion Picture ..." He routinely retained the rights to his music. Mancini's contracts allowed him to release his own albums for which he rearranged the score music into arrangements more appropriate for listening outside of the context of the film/theater. Actual film scores using players from Hollywood unions recording under major motion picture studio contracts were expensive to release on LP (ex: the soundtrack for 'Our Man Flint' (not a Mancini score) cost $1 more than other LP albums of the day). Many soundtrack albums used to claim "Original Soundtrack" or words to that effect, but were not necessarily the actual soundtrack recordings. These albums were usually recorded with a smaller orchestra than that used for the actual scoring (ex: Dimitri Tiomkin's score to 'The Alamo'). However, many Hollywood musicians were featured on Mancini's albums recorded in RCA's Hollywood recording studios and faux "Original Soundtrack" albums. Eventually some of his scores and faux "Original Soundtrack" scores by numerous composers were released in limited edition CDs. ^ a b Roberts, David (2006). British Hit Singles & Albums (19th ed.). London: Guinness World Records Limited. p. 345. ISBN 1-904994-10-5. ^ Fox, Charles (August 27, 2010). Killing Me Softly: My Life in Music. Scarecrow Press. p. 150. ISBN 978-0-8108-6992-9. ^ Akins, Thomas N. (July 24, 2013). Behind the Copper Fence: A Lifetime on Timpani. First Edition Design Pub. p. 1. ISBN 978-1-62287-368-5. ^ a b c d John Gilliland's Pop Chronicles: Show 23 – Smack Dab in the Middle on Route 66. [Part 2], The Music Men. [Part 1] (Radio). University of North Texas Digital Library. February 1969. ^ Mancini & Lees (1989), p. 51. ^ Mancini & Lees (1989), p. 239. ^ "Henry Mancini: Music from Mr. Lucky". AllMusic. Retrieved April 30, 2013. ^ a b Mancini & Lees (1989), p. 240. ^ Terrace, Vincent (2013). Encyclopedia of Television Pilots, 1937–2012. McFarland & Company, Inc. p. 380. ISBN 978-0-7864-7445-5. ^ John., Caps, (2012). Henry Mancini : reinventing film music. Urbana: University of Illinois Press. p. 149. ISBN 9780252093845. OCLC 785785359. ^ "Henry Mancini's cameo on Frasier". Destiny-land.org. Retrieved September 16, 2008. ^ "Henry Mancini Institute: History". Frost School of Music, University of Miami. Retrieved April 30, 2013. ^ Mancini & Lees (1989), p. 235. ^ Mancini & Lees (1989), p. 236. ^ Stabin, Victor (December 5, 2011). "Daedal Doodle Y". Matter Press. 25 (25): 1. Archived from the original on May 23, 2017. Retrieved February 5, 2012. Mancini, Henry & Lees, Gene (1989). Did They Mention The Music?. Chicago: Contemporary Books. ISBN 978-0-80924-496-6. "Henry Mancini". Oxford Music Online. (Subscription required (help)). Manning, Joe (2007). "Mancini's Peter Gunn Score Launched Dozens of Careers". Mornings on Maple Street. "Henry Mancini interview". The Pop Chronicles. "Obituaries: Henry Mancini". The New York Times. June 15, 1994. This page was last edited on 14 April 2019, at 13:38 (UTC).